Preparation is the key to exam success – even more so when dealing with the complex concepts and technical knowledge of virtualization. Companies look to those with virtualization certification to manage their most critical system and to administrate a network to thousands of end users. As a result, certification exams for virtualization are demanding, exploring areas ranging from the desktop to server; and require thorough knowledge of applications, hardware, and more. 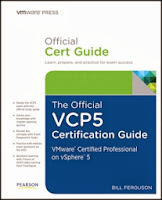 The Official VCP5 Certification Guide by VMware Press is the only guide that is authorized by VMware, written and edited by industry professionals with years of experience in managing virtualization systems. This comprehensive guide covers all relevant knowledge pertaining to the VCP510 certification exam and several VMware programs and applications including vApps, vCenter Server, ESXi, and vSphere. 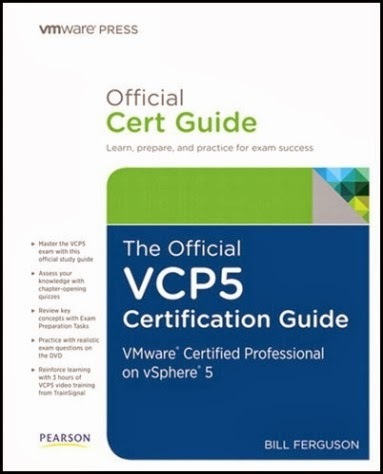 From planning virtualization systems to monitoring and troubleshooting VMware applications; the Official VCP5 Certification Guide explores all parts of the virtualization process to ensure that you are prepared for your VMware certification exam. Not only is this VCP5 Certification Guide comprehensive, but it is organized for efficient studying to ensure that concepts are reinforced. Each chapter begins with quizzes that test knowledge on the chapter’s content, helping you to decide how much time you will need to focus on each section. Each chapter ends with preparation tasks and sample exam questions to drill home core concepts. An Exam Topics list makes it easy to ensure you have covered the full range of knowledge needed for your VMware VCP5 certification exam. Before you purchase and put your VMware exam voucher to use, ensure that you are prepared for your VMware VCP5 certification exam with this detailed guide which has already helped other virtualization professionals reach success. VMware Certification Marketplace is your source for everything needed to obtain VMware certification, from the Official Certification guide, to VMware certification exam vouchers. Get the knowledge and tools you need to learn, prepare, and practice for VCP5 exam success!